What's your honest advice about marijuana use for lifters and athletes? The first question most fit people have about cannabis is, "How does it affect testosterone levels, body fat, and performance?" So let's start there. Some people think weed lowers testosterone levels, which would obviously be bad for lifters and athletes. But the science, so far, is inconclusive. Yes, you can find studies that show marijuana lowers testosterone, at least temporarily, among heavy daily users. BUT you can also find good studies that show it doesn't lower T levels at all. And, get this, you can even find a couple of studies that conclude pot actually increases testosterone levels (again, at least temporarily). Confusing, huh? And of course the pro-pot and anti-pot folks will just cherry-pick whatever studies support their views. So, it's a wash. We just don't know for sure how marijuana affects testosterone. Well, science tells us that weed stimulates the appetite, lower inhibitions, and makes food taste better. So, it kinda-sorta leads to fat gain, right? Well, not really. Marijuana has also been shown to boost metabolic rate and improve carbohydrate metabolism. And statistically, regular users have the lowest rates of obesity, even if they happen to be visited by the Munchie Monster on occasion. And honesty, the "munchies" thing is a bit overblown. "Drunk eating" is far worse and far more common. Anecdotally, many top athletes and bodybuilders use cannabis, but that doesn't "prove" anything. We can wade into the deep water and say that maybe they'd be even better without the weed... or we could say the stress and anxiety-reducing effects help them with recovery and sleep, which may trump any negative effects like impaired psychomotor abilities. As long as you don't compete stoned, that's probably not an issue anyway. Also, many lifters say their best workouts are buzzed workouts. But others lose motivation if they toke it up and can't imagine training in that dopey state. That could be an indica vs. sativa thing too. Strains matter, kids. So if you enjoy marijuana, your T levels are good, your body composition is fine, and you're building muscle, then go for it. Just be aware of the possible negatives. Finally, marijuana can be a stress-buster. And stress and inflammation are pretty much at the root of most things that can kill us. So if some of the negatives associated with cannabis turn out to be true, then you have to weigh them against its benefits, like stress reduction. Then, decide for yourself. I think using marijuana is fine as long as fitness people follow the 80-20 principle where they're unimpaired 80% of the time and high maybe 20% of the time. Wait a minute... I think I'm confused. That's right, you should eat healthy foods 80% of the time and eat fun foods maybe 20% of the time. That advice really doesn't work for weed at all. That kind of occasional mental impairment thing would probably be one of the biggest problems associated with fitness people smoking/using too much. Otherwise, there's not too much to worry about. True, it can lower testosterone and elevate estrogen, but the effects would be marginal and temporary and more likely to happen to people who spend the bulk of their days peering through a smoky haze. Plus, there's a lot to be said about the potential benefits of the CBD oils contained in weed. There are cannibinoid receptors throughout the body and activating them (through smoking or ingesting CBD oils) can influence appetite, pain sensation, memory, and of course mood, along with ameliorating certain conditions or disorders like epilepsy, high blood pressure, and inflammation, all of which could be invaluable to athletes and regular Joes alike. Hell, even mother's milk contains cannibinoids, so you just know there's something more going on with these things than we're aware of. One thing to be aware of, though, regarding CBD: It appears that it works better when it contains some THC. In other words, "legal" CBD oils that don't contain any THC might not be of much use in curbing pain or inflammation. In general, I'd caution first-time users, or people who used to smoke years ago and now, because of changed regulations in their home state, want to take up the habit again. Today's pharmaceutical-grade weed is extremely powerful. When I was a teenager, I used to stash marijuana cigarettes inside the handlebars of my bike. They were weak back then. You had to smoke 14 of them and fall off your bike onto your head to feel anything. I gave it up soon after, but fast forward 30 years to when a Dutch hairstylist gave me some of his prescription weed to take home. I took two puffs. Two. I got super anxious. My heart rate accelerated to a scary level. I thought my dogs were staring at me, and I got increasingly angry at them. Told them they're not good dogs, not good dogs at all! I laid down on the couch and turned on SpongeBob Squarepants to calm myself, but that proved to be a mistake. SpongeBob terrified me. I covered my eyes and sobbed, "Too yellow... too yellow!" It wore off a few hours later, but the lesson was an important one: Current varieties of weed are not to be trifled with. Start slow. I have a strategy for cannabis use which keeps me from overeating, and I'll share that in a sec, but there are some things we need to tackle first. Some lifters say cannabis is a bad idea because it'll make you pig out on junk food. How do they know this? Because that's the wisdom they've taken from old clichés, TV shows, tired jokes, and their uninformed friends. So it must be true, since that's what people have been saying for decades. But the cannabis-junk-food myth is almost as bad as the 'roid-rage myth. If you still think pot makes everyone fat and unable to make good dietary choices, then you're just as bad as those who think steroids make everyone outraged. It's simply not true. If pot really did that, wouldn't Colorado have at least somewhat of a higher obesity rate with its prevalence of marijuana users? It doesn't; it's actually the leanest state in the USA. CAN marijuana make you eat an abundance of unhealthy things? Well, it depends on a few more complicated factors, like the type and amount of marijuana you use, your body chemistry, and how you eat on a daily basis. If you're a person who generally eats crappy food, and your kitchen is filled with crappy food, then absolutely yes, you will eat the way you already do, possibly in greater proportions than normal. But you know what happens when a healthy eater has 2-5 milligrams of cannabis in an edible a few hours before bed? She falls asleep watching Netflix after dinner. Oooooooh so risky. What dangerous behavior. The thing is, when you feel uninhibited around food, you kinda care less about hitting your macros or getting the proper nutrients. That's why you need to prepare a satiating, healthy meal before the cannabis kicks in, and generally keep your kitchen free of junk food. But think about it. This fear of eating poorly can be applied to alcohol use as well. And how you act around alcohol is likely how you'll act around cannabis. If you overindulge in one thing you'll probably be the type to overindulge in the other thing. And either way, your diet will be the last thing on your mind. Remember though, millions of people drink alcohol and use cannabis responsibly. You just may not be one of them. Are there studies showing that cannabis may affect your appetite? Sure, but there are also studies showing that cannabis users are thinner, have smaller waistlines, lower blood pressure, lower fasting insulin, and often have an improved gut microbiome with pot use. The better question is, are you smart enough to alter your behavior and set up your environment in a way that gives you the dietary advantage... even when using cannabis? You could be if you wanted to. 1 – Choose the right type. Smoking isn't my thing, and I like the accuracy of edibles. By law, manufacturers have to make sure that every serving size contains a uniform amount of marijuana. So unless I'm in a lot of pain, I'll break up standard serving sizes into even smaller sizes. This is called micro-dosing. And I'll use dark chocolate edibles or flavorless packets of cannabis, which you can dump straight into a glass of water or a recipe. There are even cannabis teas that are already pre-measured and micro-dosed and have so little cannabis that you never feel high... just less grumpy. 2 – Think about the cannabinoid ratios. This is important, and not enough people consider it. I make sure that there's at least a 1:1 ratio of CBD to THC in the products I use. CBD is known for its medicinal effects; THC for its fun effects. 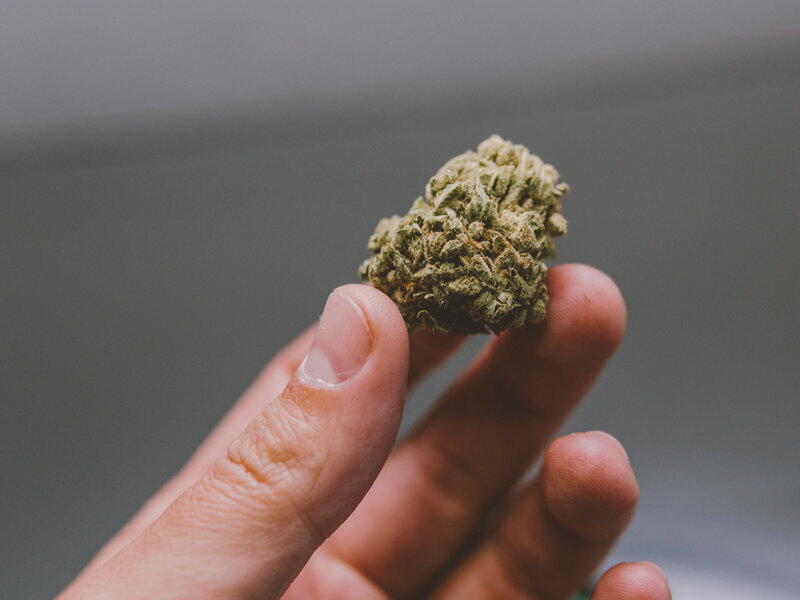 There's a lot of research showing that CBD has neuroprotective benefits, which means that it's possible the potential drawbacks of THC can be thwarted by including an equal or greater amount of CBD with it. 2 – Know the strains. There are two popular strains that you'll find in pot shops: indica and sativa. Indica is said to be more relaxing, while sativa is said to be more energizing. (This is not always the case though.) I choose products that are mainly indica. This helps with sleep and keeps me from popping awake with anxious thoughts. 3 – Have it while making dinner, a few hours before bed. When you eat or drink cannabis, as opposed to smoking it, it can take up to two hours before you feel its effects. So I have it before dinner, and once I feel it, I've already eaten, and am likely too tired to pig out. If I DO get hungry for something after dinner, I'll usually just have any of my protein-packed treats. But trust me, the evening after a leg day or a back workout has always increased my appetite far more than cannabis. And this includes those times when my doses weren't "micro" at all. 4 – Go to bed. Despite what people think, you don't instantly go into a crazed reefer-madness-like frenzy after using marijuana. In fact, it's quite possible to use it and still make better choices than people who don't. Appropriate doses of cannabis won't keep you from doing normal responsibilities like cleaning the kitchen, washing off your makeup, brushing your teeth, flossing, giving your dogs goodnight kisses, reading a few pages from your Kindle, or saying your prayers. B, have you ever smoked weed before? When I was in high school a few times. Didn't like it but I know there are 10 million types so who knows if I would like other types. Others I know use it only a few hours from bedtime for better sleep and recovery.